The halfway point of the year can be a bit of a shock. The stark reality that a full half of your year is gone can be painful, especially if you're working toward big goals and aren't sure of your progress. Sometimes you'd rather shuffle those grand plans under the rug than face up to failure. But don't give in to the temptation to avoid a close look at the progress you're making or not making. Ignoring your goals, and the work you've done or haven't yet done, is dangerous. Even if you're way behind, it's much more productive--and, ultimately, much more satisfying-- to take an honest look at where you are, evaluate your options, and make some decisions about how you will proceed. Maybe you've been powering through and are making great progress toward your goals. If so, that's great! Take a look back and enjoy seeing what you've accomplished. At this point, the danger is letting complacency set in; you want to keep moving forward and avoid that mid-year slump that can derail your progress for the remaining half of the year. Checking in on your goals might show you progress you didn't know you'd made; that's always encouraging. Checking in can also give you some insight about how you need to change your goals: you might have set one goal, such as "increase sales" or "implement a training program," but find yourself pursuing another. If that's the case, look for overlap between the goal you set and the one you're actually pursuing. They may give you the same results (for example, reducing overhead or increasing sales can improve profitability); if so, perhaps you need to change your stated goal to match your actual, in-progress goal. If not, however, look at the obstacles that might be keeping you from pursuing your stated goal and how you can remove them. There's a reason you're not making progress on your stated goal: find the reason, and you'll be able to deal with it. Checking in can also give you ideas about how to drastically improve the process, the approach, and the overall experience and productivity. Planning is helpful, but acting is how you learn what really works and what doesn't. At the beginning of a new year (or anytime you set a new goal), you rely mostly on your plans to help you make decisions and start off strong. At a mid-year point, however, you can gather data and learn from it. This is why honesty is so important: you need accurate data in order to benefit from what it tells you. 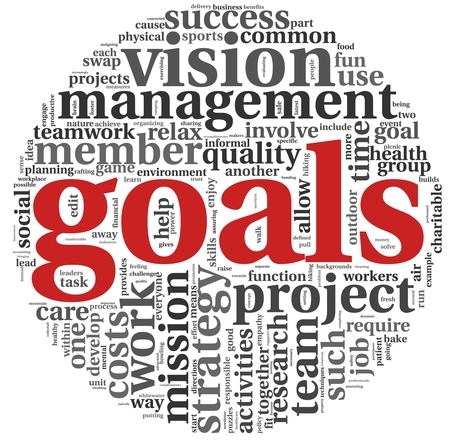 Go back to your goal list (if you're pursuing more than one) or your goal description. Ask yourself, Wh ere did I start? and Wh ere am I now? or some version of those questions. The point is not to berate yourself or anyone else involved; it's to accurately assess your rate of progress, the obstacles encountered, and to determine how you can keep going and even improve for the rest of the year. Absolve yourself from guilt or embarrassment over anything you perceive as a failure. There's no moral obligation here; pursuing goals is a decision you make, and the actions you take or don't simply reflect your interest in and commitment to that decision. If you're still interested and committed, look at the actions needed next and how you can make it easier on yourself to accomplish them. Ask yourself, Wh ere do I want to be in another six months? The best news here is that you're at a halfway point: there's still a lot of time left in this year to make great progress on a goal you care about. Set some markers for progress, one every two to four weeks, and check in when you reach each marker. A little at a time adds up to a lot, and you've got six more months in this year to get things done. Bitrix24 is a Web Studio Management Software. Use promocode TIP10 when registering your free Bitrix24 account to get extra 10GB.